Libraries aim to provide an answer to every customer request — if they don’t actually own a requested item, they have developed a system for borrowing it from another library which does have a copy. When this scheme was devised in the late nineteenth century the book or journal part would be wrapped up in a parcel and mailed to the library making the request. Nowadays it is obviously quicker and cheaper to send a digital file — if one already exists — which after Google scanned the holdings of many academic libraries, is often the case. At the ALA Midwinter Meeting in Philadelphia last weekend I spoke to a rep showing scanning machines for Digital Library Systems Group, part of Image Access. 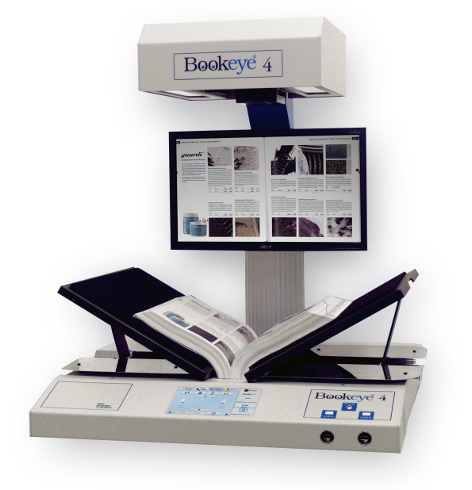 I was particularly interested in the Bookeye® 4, which is mainly used for interlibrary loans. The machine is made in Germany, and costs in the low $10,0000s I think — quite a lot to you and me perhaps, but I guess manageable in a library’s budget. As you can see from the picture it holds the bound book in an adjustable V-shaped tray while scanning. For larger originals, the tray can be lowered to make a flat surface. An operator needs to turn the page once the scan is made, but for interlibrary loan, where volume is probably not huge, this is probably not a big issue. After the 600 DPI scan is completed it automatically adjusts the image. The round cameras compensate for the differing distance of the fore-edge and the gutter as well as the wave-like curvature of the page, and will detect corners, so that the scan is already pretty straight and squared-up. The book they were using as an example, a 2-color math textbook, had lots of horizontal lines which scanned with a bow in them because of the way the pages on an open book have a wave in them, but this effect is, I believe, pretty well compensated for by the automatic adjustment phase, which hadn’t taken place when I was at the booth. Additional adjustments can be made by the operator, but in most cases it probably isn’t necessary to work at eliminating such effects — after all this is really just today’s version of the old Xerox copy which often arrived with much worse blemishes. The requesting library “orders” the loan using software such as OCLC’s ILLiad. The orders (pull slips), containing the delivery IP address and format requested, are automatically captured. Orders may be batched, and on completion are automatically sent to the requesting library by the specified method, which include FTP and email at the most basic end. Wikipedia’s entry on Interlibrary loan is quite informative. It states at the end “Some sources charge a copyright fee, which may be anywhere from $3 to $35 and sometimes higher. Policies vary about whether these fees are passed on to the patron.” Presumably they are passed on to the publisher and then to the author, though I might have thought that making a copy for individual study might have been regarded as fair use under U.S. copyright law. No doubt an industry-wide compromise was hammered out at some point. Obviously there’s a fundamental difference between mailing a copy of a book to another library, and creating a new copy, hard or digital, and the continuing development of sophisticated interlibrary loan must pose a potential threat to the sale of monographs and journals. Here’s a later story from The Chronicle of Higher Education about a test of the interlibrary loaning of e-books.